The Israeli army on Tuesday morning forced five Palestinian families out of their homes in Khirbet Hemsa al-Fouka, in the northern Jordan Valley, on account of military drills. Activist Aref Daraghma said the occupation army displaced five Palestinian families, among them children and women, and left them several kilometers away from their tents under the guise of military maneuvers. Last month, the occupation authorities ordered the five families to evacuate their residential tents for three separate days: April 24, May 1, and May 8 from 06:00 a.m. to 02:00 p.m. The Israeli occupation forces (IOF) on Monday seized heavy construction equipment in the town of al-Khader, west of Bethlehem in the West Bank, at the pretext of unlicensed construction. Local official Ahmed Salah said that the Israel army’s civil administration confiscated a bulldozer and a concrete mixer from a construction site in al-Balou area of the town. Salah told Quds Press that the civil administration claimed that Palestinian construction activities are forbidden in Area C of the West Bank, which is under Israel’s security and administrative control, and need special permits. The Israeli occupation authority continues to prevent the Palestinian landowners from building on their own lands or demolish their homes in Area C, which constitutes 60 percent of the West Bank, as part of a series of measures aimed at forcing the native residents to leave the area to pave the way for more settlement projects for Jewish settlers. Israeli soldiers abducted, on Tuesday at dawn, at least twenty Palestinians from their homes in several parts of the occupied West Bank, including former political prisoners and one child, in addition to confiscating one car and cash. Media sources in Nablus, in northern West Bank, said the soldiers invaded Askar al-Jadeed refugee camp, east of the city, and abducted Rami Abu Hdeib, after invading and searching his home. The soldiers also confiscated a jeep owned by a former political prisoner, identified as Ahmad Nabhan Saqer, in Askar Al-Qadim refugee camp, northeast of Nablus, just one day after his release from prison. Also, the soldiers invaded Deir al-Hatab refugee camp, east of Nablus, and abducted a young man, identified as Salah Omran. In Jenin, in northern West Bank, the soldiers invaded Jenin refugee camp, searched homes and abducted Ehab Abu al-Haija and Hamza Abu al-Haija, in addition to invading and searching many areas in Burqin Valley. The soldiers also injured a young man, identified as Qussai Rabea’ Mer’ey, after shooting him with a concussion grenade, before he was rushed to Khalil Suleiman Governmental Hospital, and caused many others to suffer the effects of teargas inhalation. In Qalqilia, also in northern West Bank, the soldiers invaded al-Mintar area and Azzoun town, east of the city, and opened fire at Palestinian protesters. The army also abducted a child, identified as Majd Anaya Hussein, only thirteen years of age, from Azzoun, and took him to an unknown destination. In addition, the soldiers invaded and ransacked many homes in Qarawat Bani Hassan town, northwest of Salfit in northwestern West Bank, for the second consecutive day, and abducted Othman Ribhi ‘Aassi, Jihad Ali ‘Aassi, Mohtaseb Abdullah ‘Aassi, Qassam Ahmad Mer’ey and Sa’id Ribhi Mer’ey. In Ramallah, in center West Bank, the soldiers invaded the al-Jalazoun refugee camp, north of the city, and abducted Ahmad al-‘Araysha, Ali al-Badawi, Bilal Ramadan Hmeidat, Mohammad Ahmad ‘Adarba and Hussein Ahmad Basbous. In Hebron, in the southern part of the West Bank, the soldiers invaded the home of former political prisoner, Fayez Misk, ransacked the property and fired a concussion grenade inside his home, wounding one family member, before illegally confiscating cash. Also in Hebron, the soldiers conducted extensive and violent searches of homes and abducted Jalal Yaghmour, Abdul-Aziz Abu Sneina and Jibril al-Atrash. In occupied Jerusalem, the soldiers also searched homes and abducted Abdul-Aziz Khaled Damdoum and Omar Mheisin. The soldiers also invaded the home of Arafat Najeeb, a local guard of the Al-Aqsa Mosque in Jerusalem, and summoned him for interrogation after violently searching his property. In related news, the soldiers invaded ‘Aroura village, north of Ramallah, and drove provocatively in its streets, before withdrawing. Israeli forces on Monday raided Qalandia town to the north of Occupied Jerusalem and handed over home-demolition orders at the pretext of lacking construction permits. The Palestinian activist Mahmoud Awadallah said that Israeli forces handed three home-demolition orders to families who were orally ordered to raze their homes two weeks ago. Earlier on Sunday, Palestinians had to demolish parts of their houses in Qalandia to avoid being forced to pay exorbitant costs if they were to be razed by Israeli forces, according to local sources. The Israeli military on Sunday evening threatened to cut water supplies to al-Ras al-Ahmar community, in the northern Jordan Valley. According to local sources, Israeli soldiers notified the local farmers of their intent to break down pipelines providing water to Sahl Atouf community, east of Tamoun town. 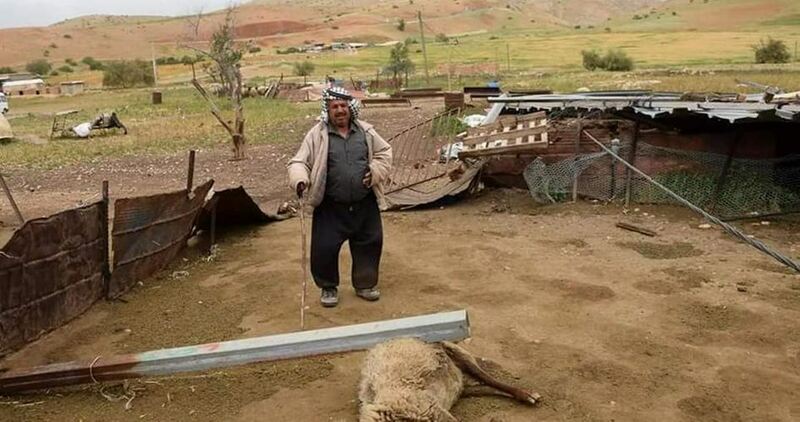 The Israeli occupation forces and authorities continue to target agricultural and residential facilities in the Jordan Valley under the guise of military maneuvers and also for the benefit of illegal settlement expansion. 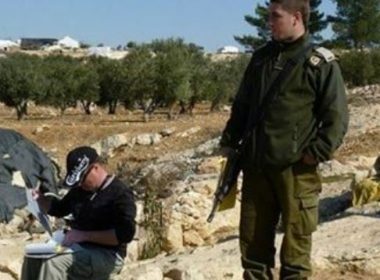 Israeli occupation forces on Sunday broke into al-Ras al-Ahmar area in the northern Jordan Valley and took photos for Palestinian properties, according to local sources. A Palestinian activist, Mutaz Besharat, said that IOF soldiers were escorted by staff of the so called Israeli Building and Planning Committee while storming Palestinian homes and tents in the area. Besharat told Quds Press that the inhabitants expressed their worries that this Israeli measure precedes the demolition of their homes and facilities. The National Office for the Defense of Land on Saturday said that the Israeli occupation authorities have recently issued new military orders aimed at facilitating settlement construction on Palestinian lands. The National Office said in its weekly report that the new orders prevent the publication of details related to the new settlement projects in Arabic, as was the case previously, to make it difficult for Palestinians to confront these projects. 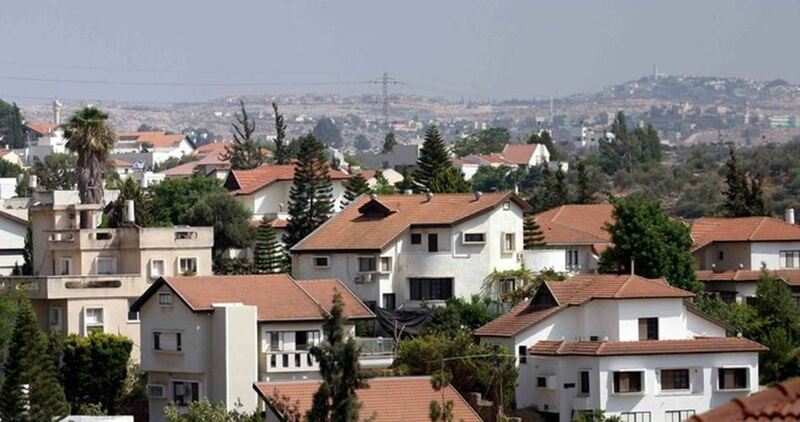 The Office explained that prior notices of land confiscation for settlement purposes used to be published in at least two Arab newspapers in accordance with the provisions of a Jordanian law which the Israeli authorities acted under for a period of time. That law enabled anti-settlement activists to obstruct settlement construction in some cases. Eli Ben-Dahan, Israel's deputy minister of war, has issued a new order that does not oblige his authorities to announce their settlement projects in Arab newspapers. They can publish them in Arabic on the website of the Civil Administration only. Ben-Dahan believes that this step will deprive the Palestinians of an effective tool usually used to disrupt the settlement expansion. In a related context, the National Office for the Defense of Land said that the Israeli Supreme Court has decided to give the residents of the Palestinian Bedouin community of al-Khan al-Ahmar in East Jerusalem a time limit that expires next Thursday to evacuate their homes. The Office said that the displacement plan targeting the Bedouins of al-Khan al-Ahmar falls in line with an Israeli project to expand settlement construction in the eastern part of Jerusalem toward the Dead Sea in preparation for ending the Palestinian presence in Area C.
The Israeli authorities further intend to open a new crossing northeast of Jerusalem near Anatot settlement and establish a wide road network to link settlements deep inside the West Bank with Israeli roads in Jerusalem. Israeli agriculture minister Uri Ariel reportedly reached an agreement with the Jewish settlers living in Netzer Hazani settlement, north of the Gaza Strip, to relocate them to the occupied West Bank. According to Israel’s Channel 7, the settlers of Netzer Hazani will be evacuated to the settlement of Ariel in southern Nablus. Minister Ariel said in Facebook remarks that he had signed an agreement with the municipality of Ariel settlement to move Netzer Hazani settlers to live there. As part of that agreement, new housing units, schools and service structures will be built in Ariel settlement at a cost of 46 million shekels ($13 million). Israeli soldiers issued, Friday, orders for halting the construction of a Palestinian home, and the demolition of a wall around a land, in Ein Jweiza area in the al-Walaja village, west of Bethlehem in the occupied West Bank. 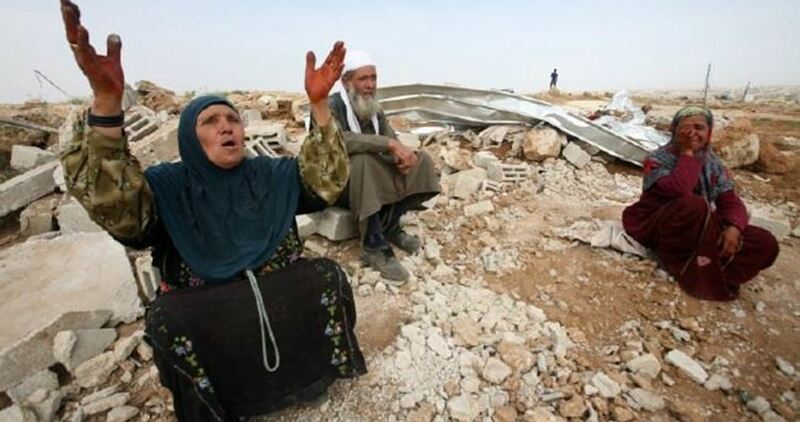 Ibrahim Awadallah, a local nonviolent activist, said the soldiers handed Issa al-Atrash a military order instructing him to halt the construction of his 120 square/meter home, in Ein Jweiza. He added that the soldiers also issued a demolition order targeting a wall surrounding a Palestinian farmland, owned by another resident, in al-Walaja. The Israeli army claims that the constructions did not receive a permit from the “Civil Administration Office,” run by the military in the occupied West Bank. Awadallah said the village, especially Ein Jweiza, has been subject to frequent invasions and violations, including home demolitions, orders targeting existing or under construction homes and property. He added that the army also bulldozed and uprooted Palestinian lands in the area, as Israel is trying to illegally confiscate the lands to make them part of Jerusalem. Israeli soldiers invaded, on Friday at dawn, Palestinian homes in Hebron, in the southern part of the occupied West Bank, and fractured the arm of a woman who tried to prevent them from abducting her son. Media sources in Hebron said the soldiers invaded the home of Bassam Abu Aisha in Jabal Abu Rumman area, in Hebron city, violently searched the property causing excessive damage, and assaulted his wife who tried to prevent them from abducting her son, Sa’ed, 27. The sources added that the woman suffered fractures in one of her arms, in addition to causing various cuts and bruises, before abducting her son. Besides causing excessive damage to the family’s home, the soldiers also confiscated cash from the property. In addition, the soldiers invaded the home of Ayed Doudin, a political leader of Hamas in the al-Alqa village, in Doura town near Hebron, just hours after releasing him from prison after he was held for 18 months under arbitrary Administrative Detention orders without charges of trial. 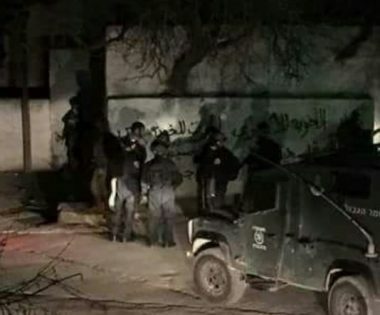 The soldiers also invaded Beit ‘Awwa town, southwest of Hebron, and searched many homes, including the home of a political prisoner, identified as Nabil al-Masalma. 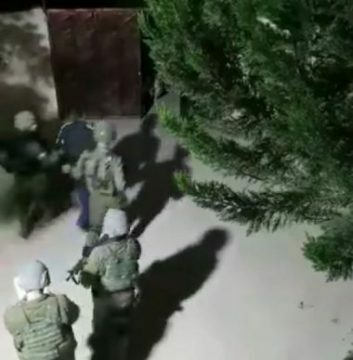 In related news, the soldiers invaded the Tarbeeqa area in Beit Ummar town, north of Hebron, and violently searched the home of Hilmi Abu Ayyash, before summoning him for interrogation in Etzion military base. Prior to withdrawing from Beit Ummar, the soldiers fired gas bombs and concussion grenades at local youngsters who hurled stones at the invading jeeps; many Palestinians suffered the effects of teargas inhalation. Jerusalem’s Grand Mufti, Sheikh Mohammed Husain, condemned Israel’s incessant attacks on the Muslim cemetery of Bab al-Rahma, adjacent to the eastern wall of al-Aqsa Mosque—the third holiest site in Islam. Sheikh Husain said such the increasing Israeli assaults against Bab al-Rahma Cemetery make part of a preplanned agenda by the Israeli government to smash headstones and violate the sanctity of Muslim dead bodies. The mufti said the increasing break-ins by the Israeli forces and settlers into the cemetery amount to a dangerous escalation and come as part of the simmering Israeli terrorism against Islamic holy sites in Occupied Jerusalem. He warned that such violations aim at wiping out the city’s Islamic identity, cultural heritage, and geo-historical character. Husain also condemned the arbitrary bans issued by the occupation authorities against the Muslim guards at al-Aqsa Mosque, urging the international community and human rights institutions, namely UNESCO, to take serious action in response to such Israeli aggressions and to pressurize the Israeli government to abide by international resolutions. 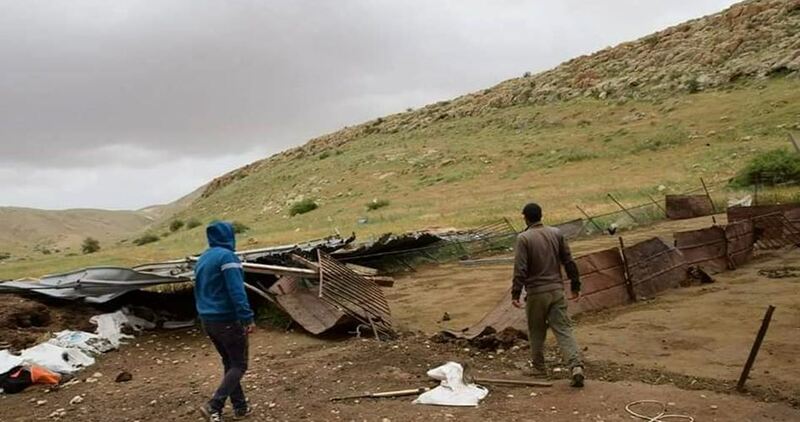 The Israeli occupation army on Thursday afternoon demolished an agricultural depot in Beit Ummar town, north of al-Khalil city in the West Bank, and confiscated crops and other contents from the place. 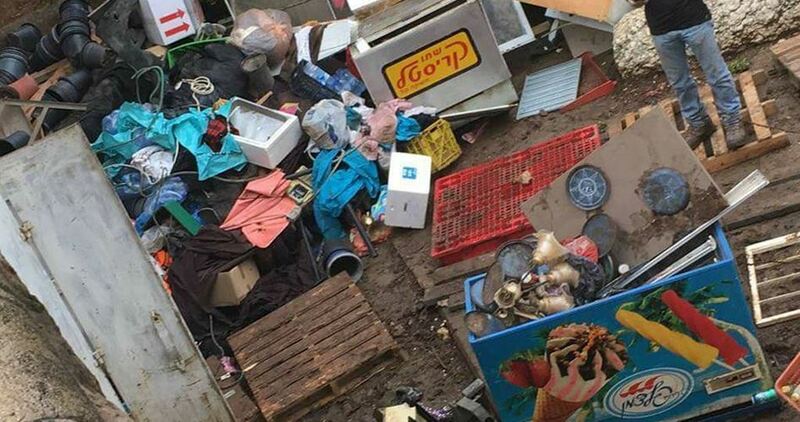 A local activist said the depot belongs to farmer Ramzi Abu Ayyash and was built several years ago on 250 square meters of land, adding that the confiscated contents from the storehouse were estimated at 20,000 shekels. The Israeli army justified its destruction of the structure by claiming that its owner did not have a license from the Israeli authorities to build on his own land. 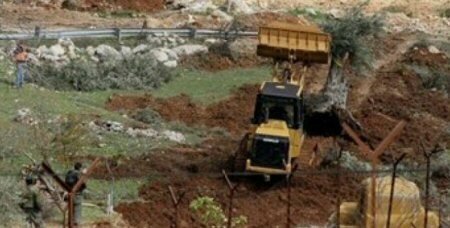 Israeli settler bulldozers, on Thursday morning, have razed the lands of Kafr El Deek town in Salfit, northern West Bank. 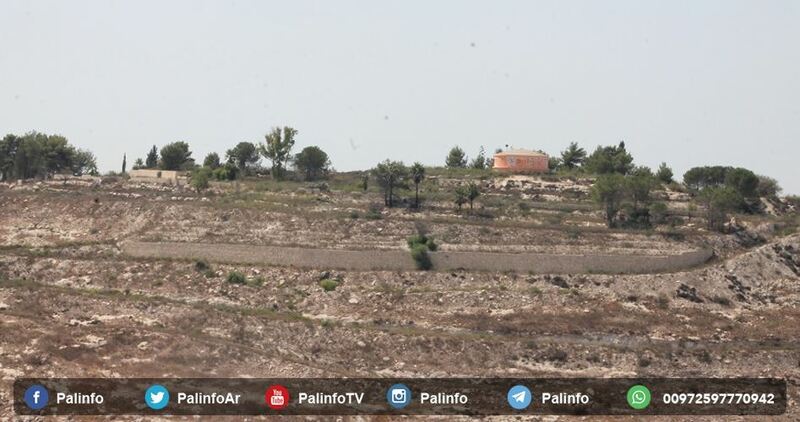 Eyewitnesses confirmed that the bulldozers leveled lands west of Kafr El Deek, west of Salfit, in order to expand the settlement of “Aleh Zahav”, adding that they were used for herding poultry and had olive trees. Researcher Dr. Khaled Maali said, according to the PNN, that the bulldozing was being carried out in favor of the expansion of the Aleh Zahav settlement and its industrial zone. He pointed out that 25 settlements in Salfit have been expanding in different directions, starting from the Za’tara checkpoint to south of Nablus, and ending at Kafr Qasim, to separate the northern West Bank from its south and center, thus ending the dream of a Palestinian state. Dozens of Israeli settlers forced their way on Thursday into al-Aqsa mosque courtyard under police protection. 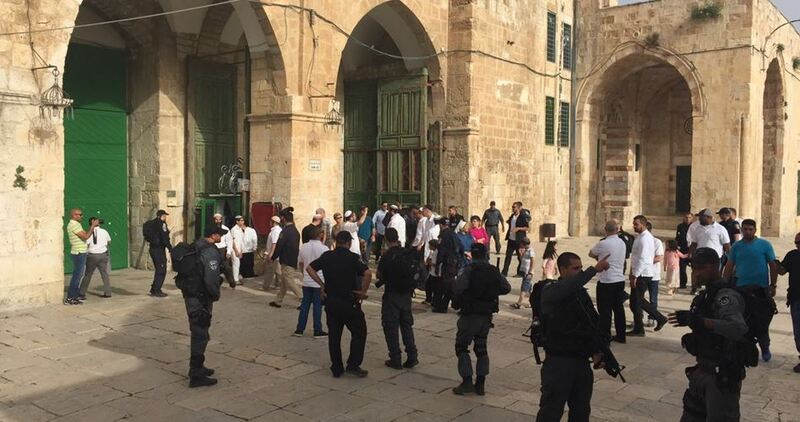 Islamic Waqf Department in Jerusalem said that 63 settlers stormed into several groups the holy shrine through the Bab al-Magharibah under tight protection of Israeli soldiers and special police forces. 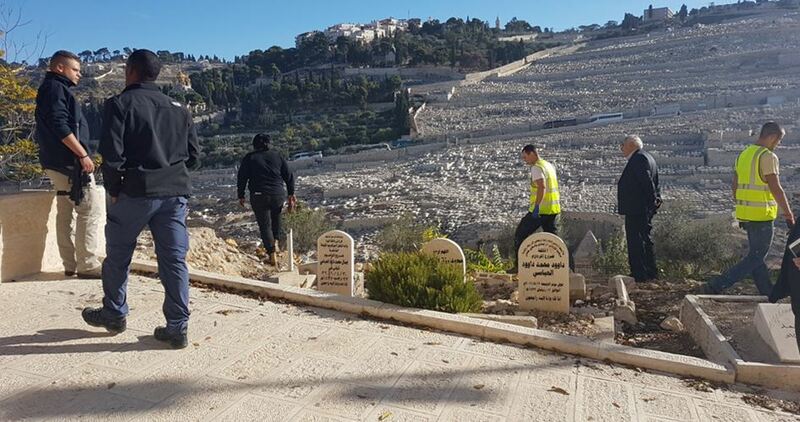 Meanwhile, Israeli Nature Authority continued its provocative Judaization campaign in Bab al-Rahma Islamic cemetery for the fifth consecutive day as a prelude to turn it into Talmudic parks. For the fourth consecutive day, Israeli forces continue to attack the centuries-old Bab Al-Rahma Islamic cemetery near Al-Aqsa mosque, by digging up graves of Palestinians. 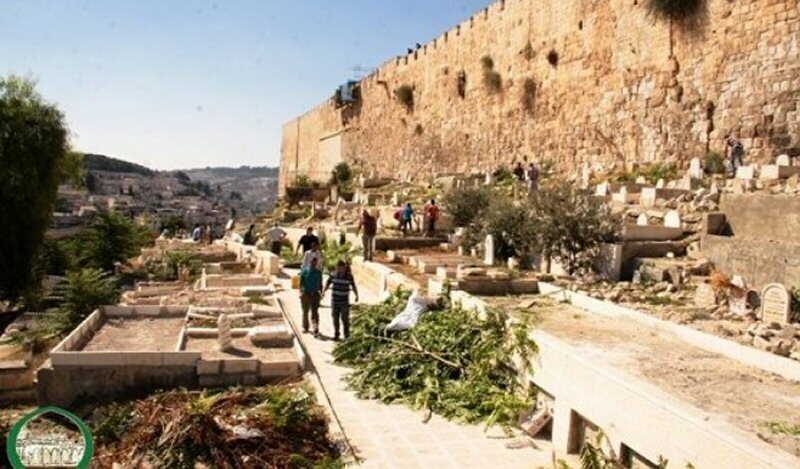 According to the PNN, WAFA agency reported, on Wednesday, that a number of Palestinians were injured after being physically attacked by Israeli forces, as the latter continued to desecrate an ancient Muslim cemetery, just outside Jerusalem’s Old City wall. The soldiers continued to dig up graves and land in the cemetery, and to place metal fences in parts of it, while soldiers assaulted a group of Palestinians who managed to access the cemetery and attempted to prevent the continuing violation of the cemetery. Israeli authorities intend to build a “National Park” on its lands. Desecration of not only Islamic holy sites, but Christian as well, by Israelis, occurs on a near routine basis, in occupied Palestine. 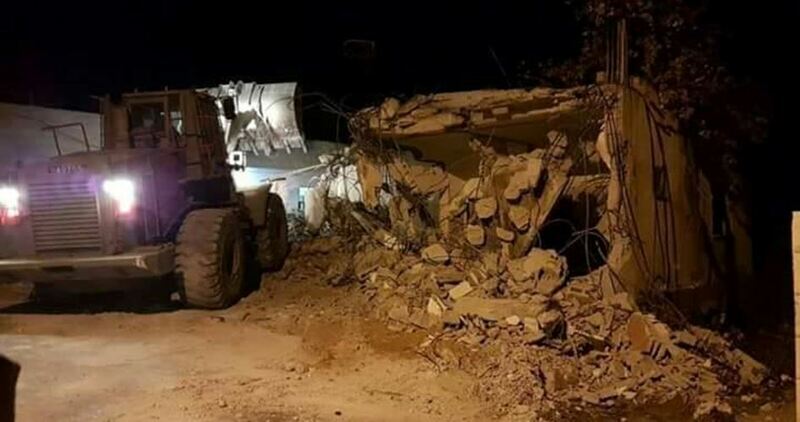 Israeli bulldozers on Wednesday morning demolished a house under construction and a shop belonging to Palestinian families in Taybeh city, in territories occupied in 1948, under the pretext that they were built without a permit. 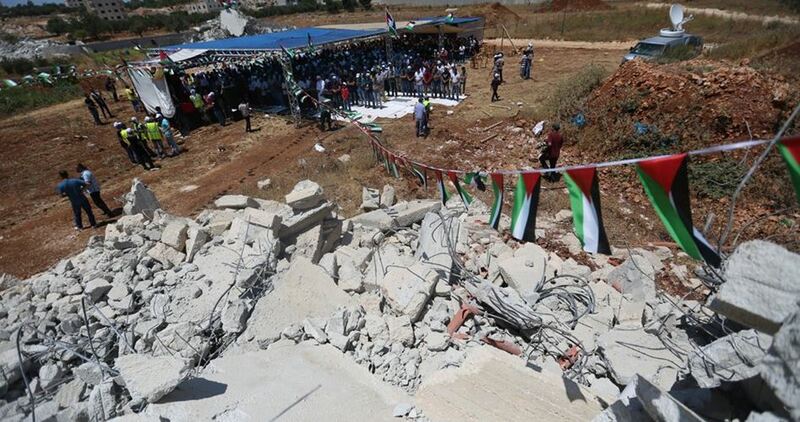 A large Israeli force accompanied the bulldozers as they proceeded to demolish the house, which the Israeli planning and zoning committee allege they were built in an agricultural area. The Israeli occupation authorities also forced a Palestinian to demolish his own shop, adjacent to the demolished home, under the guise of unlicensed construction. 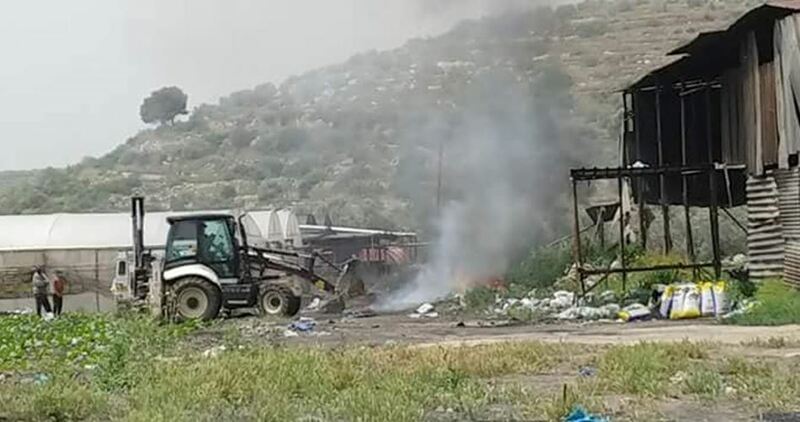 The Israeli occupation forces (IOF) on Tuesday destroyed a Palestinian facility for manufacturing charcoal in Ya'bad town south of Jenin. 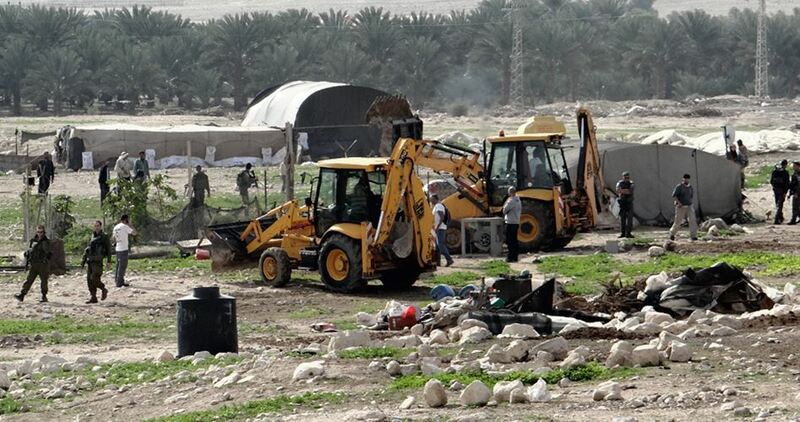 Local sources told the PIC reporter that Israeli bulldozers escorted by IOF soldiers razed agricultural lands near Ya'bad and demolished the reported facility. The sources said that the Israeli forces have demolished more than 200 charcoal plants in Ya'bad over the last two years destroying the town's most vital economic activity and forcing hundreds of Palestinian citizens into unemployment.